Darjeeling: The search and rescue operation for missing mountaineer Pemba Sherpa by the Indo-Tibetan Border Police and Sherpa mountaineers in Jammu and Kashmir yielded no results till Sunday evening as anxious family members keep waiting for news at the mountaineer's residence in Ghoom, Darjeeling. 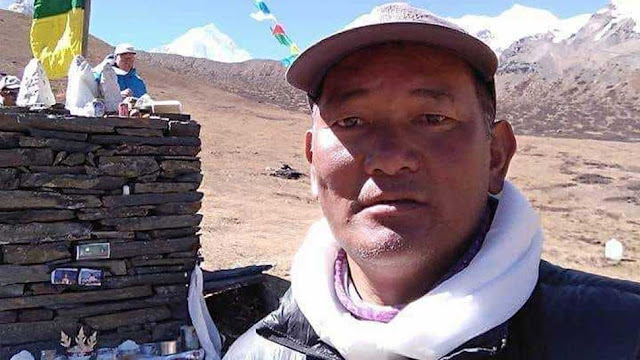 Veteran mountaineer Pemba Sherpa, who had scaled Mount Everest eight times and successfully summited six of the world's highest peaks, had gone missing between camp 2 and camp 1 after summiting Saser Kangri IV (7,672 meters), a peak in the Karakoram range of Jammu and Kashmir. The 47-year-old Pemba was accompanying a team of mountaineers from Mountaineer's Association of Krishnanagar (MAK), West Bengal and Pune, Maharashtra, as a climbing guide. On June 20, the team had departed from Krishnanagar. The veteran mountaineer from Darjeeling had summited the peak along with two others early on Thursday. "On Friday, we received a phone call that my brother has gone missing between camp 2 and camp 1. It is believed that he has fallen into a crevasse. Other Sherpas (some related to Pemba) have joined the search operation along with an ITBP team. The search and rescue operation has not yielded any result yet," stated Tashi Sherpa, brother of the missing mountaineer. Tashi, who is also a mountaineer, was part of the expedition but had returned to Darjeeling on July 3 from the base camp. Pemba's mother, wife, two daughters and a son reside at Ghoom, 8 km from Darjeeling. "We are praying that he returns home safe," stated the mountaineer's daughter. The family has urged the State Government for help. "The state Government is following the matter closely with authorities in Jammu and Kashmir," stated Joyoshi Das Gupta, District Magistrate, Darjeeling.